Posted by liverpoolchamber in awards. You are invited to enter the Liverpool Daily Post Regional Business Awards. Demonstrate how your business is facing up to the current economic challenges by sustaining investment and development. Reward the courage, hard work and irrepressible spirit of colleagues. Open the doors to new opportunities. The Regional Business Awards can open the doors to new suppliers, customers, investors and partners – it tells them your company is credible and serious. The ceremony will take place once again in front of an audience of 500 guests in the magnificent surroundings of Liverpool’s St George’s Hall. It is always one of the most memorable evenings in the city’s social calendar, and this year, of all years, you and your team owe it to yourselves to be there. Posted by liverpoolchamber in awards, Culture, Liverpool. At a packed special Awards Ceremony in the Wake Theatre at Novas Contemporary Urban Centre tonight, AL and AL were presented with the prize of £2000 as winners of the Liverpool Art Prize 2009. Also after counting over 1000 votes cast by visitors to the gallery it was announced that Elizabeth Willow was the winner of the £1000 ‘People’s Choice’ prize. The ceremony was hosted by artinliverpool.com who set up and organise the prize which started in 2008 during Liverpool’s reign as European Capital of Culture. For the Art Prize exhibition AL and AL presented new work including ‘I want to run in my mountains’ (2009) which features ‘Biped 00’ running through a shower of pink triangles high in the mountains as ‘Biped 01’ is measured and recorded in a motion tracking volume. The anaglyph video works have been commissioned for an exhibition in the city of Mechelen Belgium, the location from which the trains destined for Auschwitz departed. The pink triangle was the Nazi German symbol for homosexuals, many of whom were murdered by the regime. The scientific quest to measure, quantify and ultimately control human behaviour is mirrored in the reflective world of the Avatar series where AL and AL’s studio performances have been transformed into biped animations using motion tracking biometric technology. Also their ‘The ‘Suit of Cups’ (2009) places ‘Biped 00’ and ‘01’ as the central protagonists in a selection from the Tarot Deck; playing cards which are used to contemplate an individual’s predicament and divinate a possible future. The new rational world of measuring human behaviour is composited into the old irrational landscapes of superstitious symbolism. The closing date for the Merseyside Innovation Awards is 18 May. The awards aim to recognise and reward the use of innovation as a means of boosting growth and profitability. The final takes place on 9th July at Crowne Plaza Liverpool and the judges are Trevor Bayliss inventor of the iconic wind up radio and Professor Murray Dalziel. Chair of the judging panel, Brian McCann, of Vanguard said: "Last year, 2D Heat, creators of an energy efficient spray-on heating element won the awards. Merseyside is a breeding ground for many world-class innovations. I would urge anyone with a great idea or product to fill in an application form and see what happens." The awards are open to individuals or companies with less than 50 employees who are based within Merseyside. They could win £10,000 in cash, £4,000 worth of legal, business, accounting or design consultancy; support from some of the region’s leading business advisors; and publicity for the idea. Posted by liverpoolchamber in awards, British Chambers of Commerce. Are you a Liverpool Chamber member? Then you could enter the Chamber Awards 2009 and be in with the chance of winning £50,000. The Chamber Awards were launched by the British Chambers of Commerce (BCC) in 2004 to recognise and celebrate business excellence through the successes and achievements of its Accredited Chambers of Commerce, their members and non-members. The world of commerce is increasingly competitive, due to factors such as e-commerce and ever changing economic climates. As a business in the UK you have to work harder and smarter for success. As a member of an Accredited Chamber of Commerce you are part of a wider national business network, and the Chamber Awards provide you with the opportunity to gain recognition on a national scale for the hard work and achievements of your business. Previous winners have experienced year round exposure from the Awards programme including appearances on TV. With the added incentive of winning a £50,000 cash prize for your business, can you afford not to enter?! The Merseyside Innovation Awards 2009 are still open for entries. Individuals and businesses with fewer than 50 employees with innovative ideas and inventions are invited to register online at www.merseysideinnovationawards.co.uk for the chance to be a monthly winner or next year’s overall winner, who will receive £10,000 in cash and £4,000 worth of invaluable business advice, as well as publicity for the idea. The awards are sponsored by Insider, Amatica, BBC Radio Merseyside, Brabners Chaffe Street, Business Link, Liverpool Chamber of Commerce, Liverpool Ventures, Paver Smith, RBS NatWest, RTC NorthWest, University of Liverpool Business Gateway, Vanguard Corporate Finance and WP Thompson & Co.
Posted by liverpoolchamber in awards, Chinalink, Events. Liverpool Chamber, in partnership with UK Trade & Investment and the North West Development Agency, would like to invite you to a banquet dinner to welcome Chinese New Year (Year of OX). At the dinner, we will recognise and reward North West England business and individual’s dynamism and success in Greater China. Courtesy of Finnair, a business class flight ticket to China will be presented to the Award winners. Entries are invited from companies doing business in mainland China, Hong Kong, and Taiwan, demonstrating a strategic approach to at least one of the three markets. Nominations are invited for an individual or organisation that has made a significant contribution to develop business links with mainland China, Hong Kong, or Taiwan. Download award criteria details here. Places are limited, so register now to guarantee your place! Tickets are £55 +VAT per person, or £480 +VAT for a table of ten. Posted by liverpoolchamber in awards, Events. The contribution made by black and ethnic minority businesses in the Northwest is invaluable to the economic, social and cultural development of the region. The EMBF NW Awards are designed to recognise and reward the outstanding achievements made by black and ethnic minority entrepreneurs and businesses in the Northwest. From dynamic young entrepreneurs to well-established veterans, these businesses are making a significant impact to the Northwest society. Following the success of our inaugural event, The EMBF NW Awards 2009 will take place on Thursday 12th March 2009 in the ‘Theatre of Dreams’ Stadium at Manchester United Football Club, Manchester. This prestigious event will champion Black Minority Ethnic talent from across the Northwest and bring together individuals and businesses from a wide array of fields. The award categories include Social Enterprise of the Year, Entrepreneur of the Year and also the Northwest Business of the Year. Visit the website for more information or download the application form. Deadline for entries is 26 Jan 2009. Posted by liverpoolchamber in awards, Environment, Events, News. Businesses of all shapes and sizes are now being invited to enter the 2009 Northwest Business Environment Awards. Environmental Innovation and Environmental Champions. The awards are a great way to let customers and staff hear about your hard work. Winning an award can help raise profiles and boost reputations as well as gaining recognition from the high-profile media and marketing campaign. Previous finalists have all cited the awards as a great opportunity to demonstrate their green credentials. Entry to the awards is free and easy, and I have taken the liberty of attaching the entries forms. Entry can be made online at the Mersey Basin website. If you would like to discuss your entry in more detail, please contact the Mersey Basin Campaign direct on 0161 242 8200. Closing date for entries is February 2nd 2009. Posted by liverpoolchamber in 2008, awards, Capital of Culture 2008, Culture, Liverpool, News. Liverpool Cathedral was last night announced as the first winner of the Liverpool Chamber of Commerce Arts Award. The award is designed to stimulate Liverpool’s tradition of patronage by rewarding the company or organisation who funded the best publicly available art in Liverpool in the last five years. 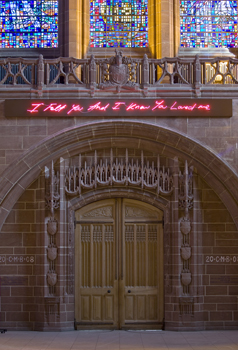 The piece, titled ‘For You’ by Tracy Emin, RA takes the form of a pink neon wall mounted sign in Tracey’s own handwriting carrying the message ‘I felt you and I knew you loved me’ The judges were impressed with this dual personal and spiritual message in such a sacred space. The judging panel made up of the crème of the Liverpool arts establishment ; Lewis Biggs Director of Liverpool Biennial, Brenda Parkerson, Business Development Manager of Arts & Business, John Entwistle, sponsor and Christoph Grunenberg Director of Tate Gallery Liverpool felt that the Cathedral’s on-going work with such a cutting edge contemporary artist had produced a very bold and courageous piece. Posted by liverpoolchamber in 2008, awards, Capital of Culture 2008, Culture, Liverpool. Liverpool Chamber of Commerce is keen to maintain the Capital of Culture momentum and recognise Liverpool’s business community’s long tradition of arts patronage with the launch of the Liverpool Chamber of Commerce’s Arts Award. “The award is designed to encourage and reward patronage of the arts in Liverpool, recognising Merseyside companies who invest in artistic endeavours. The Chamber has secured four of the most respected authorities in the city’s arts scene as judges for the prestigious event, Christopher Grunenberg, the director of the Tate, Lewis Biggs, director of the Liverpool Biennial and Rayahn King, Fine Art Curator, National Museums Liverpool and a representative from Arts & Business will asses the artworks. The award for the most innovative piece of commissioned artwork will be presented at Liverpool Chamber’s annual dinner on the 20th November at the BT Liverpool Convention Centre. It will be presented to the Liverpool business judged to have commissioned the most impressive work of public sculpture in Liverpool since 2003 and has been made possible thanks to the kind sponsorship of former Chamber Chairman and Trustee of the Royal Academy, John Entwistle. To enter or for more information contact Pamela Holstein at Liverpool Chamber of Commerce 0151 227 1234 x2217 or at pamela.holstein@liverpoolchamber.org.uk. Or download an application form and enter now.